In a normal gearbox, a “dog ring” between two gears slides one way or the other to lock the chosen gear to the output shaft. Between each gear is a neutral space where that dog ring spins freely. The Seamless transmission eliminates that neutral space by using “bullet rings” to engage the gears. A gear is selected when one ring is moved until its bullets hook onto drive teeth on the side of that gear. A second bullet ring moves in the same direction with its bullets filling the gap between the teeth, eliminating any slack between the gears. Eliminating this slack is what creates seamless upshifts and downshifts, even allowing mid-corner shifts without upsetting the chassis. Seamless Transmission uses gears that spin freely on the output shaft when they’re not engaged, with internal ratchet mechanisms in each gear. There are four pawls on each ratchet – two take drive loads when the ratchet is engaged and the other two are used to limit backlash. During engine braking, the backlash-limiting pawls take the load. These pawls are normally held in the “neutral” position, so the gear isn’t engaged, by sliding rods inside the output shaft. These rods have indentations in them, so when they’re slid into a particular position, they allow the pawls for one gear to engage (the pawls are sprung, so they will pop out and try to engage the ratchets on the inner circumference of each gear as soon as the selector shaft allows them to). 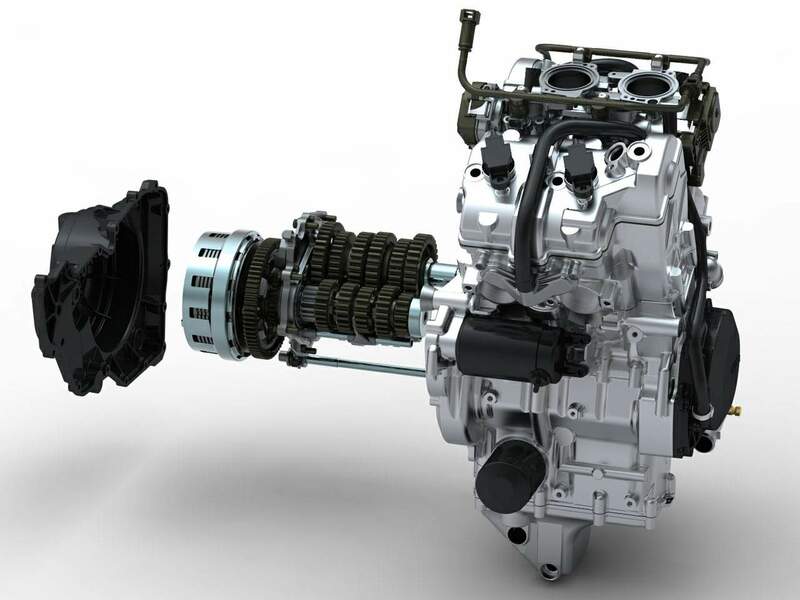 Honda’s DCT twin-clutch system (banned by MotoGP rules) uses hollow output shaft technology to run one shaft within another to drive both clutch baskets. On changing up to the next gear, first the backlash pawls in the first gear are disengaged (but not the drive ones) and the drive pawls in the second ratio are engaged. As the 2nd gear pawls connect with the ratchet inside 2nd gear, they take the load and accelerate the output shaft. Because the ones in 1st gear act as a ratchet, they can remain engaged right up to that moment – when the output shaft starts spinning faster than the 1st gear output ratio, the pawls will get pushed out of the way. Then, in the second stage of engagement, the backlash pawls in 2nd gear will be released and slot into place while the drive pawls in 1st gear are locked out of the way. This new take on gear engagement has a couple of key advantages: First, it’s a seamless-shift arrangement (1st will be driving right until the moment 2nd gear takes over, and so on) so there’s no loss of drive. Second, there’s no conventional selector forks or gearshift drum, so it’s ultra-compact (the selection process is done via the rods inside the hollow output shaft). A corollary of that is that the gears themselves can be wider, and therefore stronger. Honda is leading this technology. Honda can shift in just 0.009 seconds—significantly faster than the 2013 Yamaha M1's conventional transmission, which takes 0.038 seconds. "Since the introduction of the system, speculation has been rampant as to exactly how much advantage Honda's gearbox confers. Wild guesses were doing the rounds, with the highest guess being that it would give an advantage of 0.9 seconds a lap, an absolute eternity. According to one of the journalists over at GPOne.com, Filippo Preziosi said he believed that Honda's gearbox was probably worth around 0.2 seconds a lap. In my adopted home of the Netherlands, they have a saying: "Meten is weten", to measure is to know. In that spirit, I went out to the side of the track during the test, and took a number of recordings of bikes exiting Turn 10 and shifting up the gears, going past and shifting up. On the basis of those sound recordings, I tried to estimate the length of the gearchange for each of the bikes that I had recorded. "For me in one lap doesn't change a lot,” Rossi said. “I mean about the lap time. We try… we try to make some comparison. A lot of people speak about two-tenths for a lap - I think is less than two-tenths. 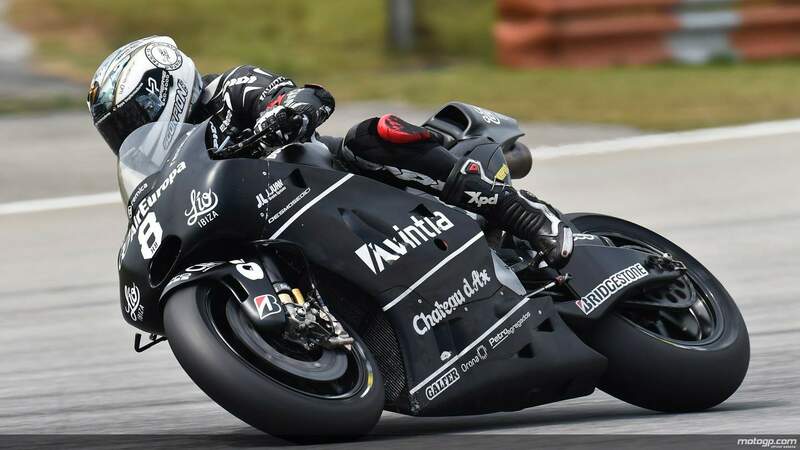 But the big improvement is I think in the 20 or 30 laps because the bike become a lot more easier to ride, more stable, more stable in acceleration, but also more stable in braking, in the next braking. For me, it's better for the tires, less stress for the tires, and also is very good for the riders because the bike become more easy to bring at the limit and more difficult to make a mistake. So I think it's something very important for the race distance more than for one lap."